A mystery Motorola device just cruised through the FCC and it may have been the XOOM 2. 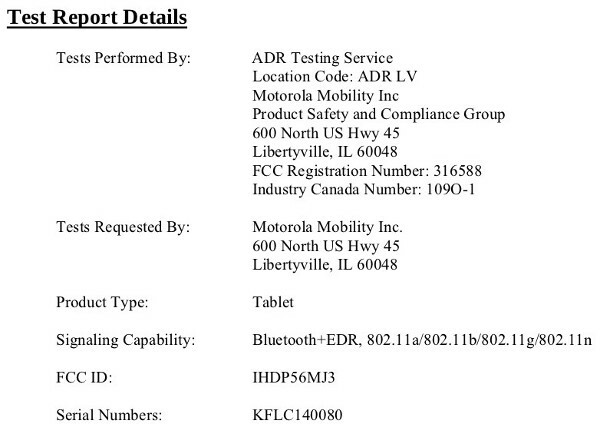 The device is marked with an FCC ID of 56MJ3, which marks it as part of Moto’s flagship tablet line. The documents state the this mystery device will sport a 1.2GHz dual-core processor, 1GB of RAM, HDMI out and have a 1200 x 800 display. Additionally, it will be available in 16, 32 and 64GB models and has both WiFi and Bluetooth connectivity. Could this be the Motorola XOOM 2, or perhaps another variant of the original XOOM? However, the specs due resemble the leaked ones we posted a month ago, feel free to sound off in the comments.